This weekend, I think I just made my twentieth, and last, visit of the year to La Maison du Whisky. For the life of me, I have no idea what prompted me to go to a liquor store the Saturday before Christmas. Well, actually I do. 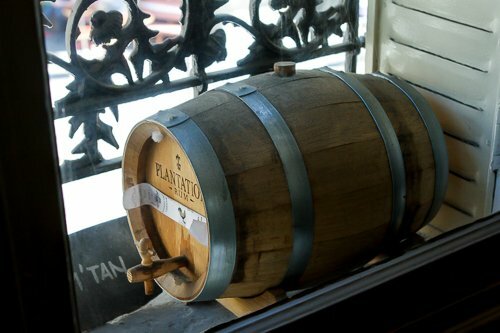 I was preparing to refill one of my empty cocktail aging barrels and the next cocktail on the docket required red (sweet) vermouth. After exhausting the three liquor stores in my neighborhood, who had no idea what I was talking about (although one caviste thanked me for illuminating him, which I thought was odd because I know very little about vermouth), I took a very crowded #96 bus over to the Left Bank to stock up on a few bottles. 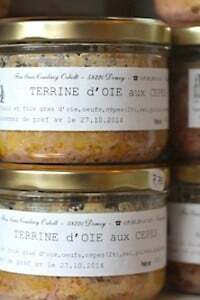 I’ve become a bit of a fan of the shop because in addition to things like vermouth rouge, they also carry those fairly obscure French liqueurs that are back in fashion elsewhere, but are hard to find on their home turf. On each visit, I usually find something that I’d never heard of, and it’s always interesting to wander around the shop and check out the curiosities, like Acqua di Cedro, an Italian distillation of citron fruits, or King’s Ginger, a liqueur made in Holland whose bottle says it is “…appreciated by bon viveurs, sporting gentlemen and high-spirited ladies.” Who, coincidentially, are just the kind of people that I usually hang out with. Maybe it’s just that it’s taken me a few months to sober up (or I’m still recovering from the bus ride), but I’m finally getting around to sorting through a tasting of aged cocktails that I took part of at La Maison du Whisky a few months back. 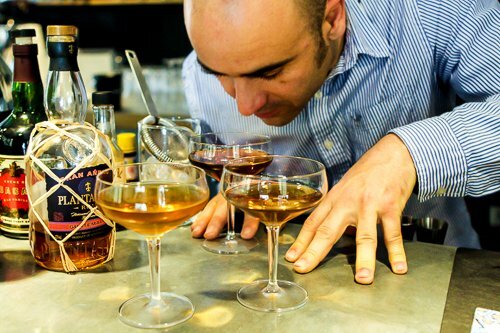 It wasn’t a formal tasting; I’d expressed an interest in learning more about barrel-aged cocktails and Stanislas Jouenne, who mixes cocktails and teaches the art of mixology at the store, was kind enough to shake up a few drinks for me and my friend Forest. If you pass by the shop near the Place de l’Odeon, you’ve likely been fascinated by the window with bottles of interesting and curious French (and other) liqueurs and apéritifs lined up in the window. But if you look up, resting on the balconies, you’ll see barrels perched on the balconies, where cocktails are left to age for months. 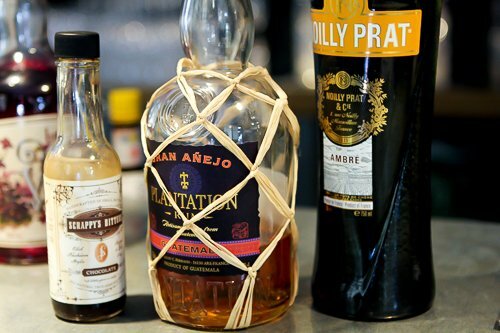 I’ve been considering taking one of the bartending courses at the shop, especially the one in how to make bitter and syrups (which I didn’t see listed on their current roster), and Stan (as he’s often known) showed me some of the herbs and roots – like star anise, angelica root, and cinnamon – that he uses from a local herboriste. 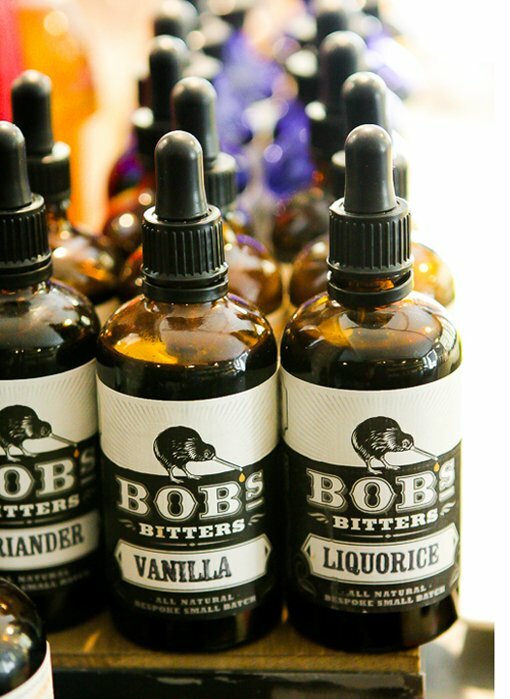 It’s something I’ve truly been meaning to tackle myself, but for those non-DIY types, there are various types of bitters on hand that add a beguiling complexity to cocktails, including those flavored with cardamom, coriander, tarragon, and chocolate. 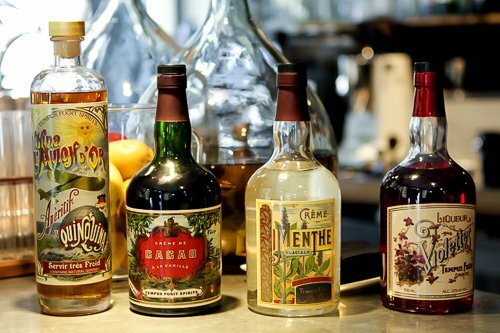 Because of the worldwide interest in cocktails and “vintage” liqueurs, companies like Tempus Fugit Spirits has been reviving a few of these forgotten flavors, with versions of liqueurs crafted in Switzerland, that contain quinine (a bitter root), a natural violet liqueur that’s a far cry from the overly sweet purple liquids one usually finds, and crème de cacao, distilled from cocoa beans and pods of vanilla. Years ago I did a tasting of absinthe with John, the owner of Tempus Fugit and when I took a sip from one of the glasses, a big splash of absinthe landed squarely in my eye. “That’s why we call that the ‘money shot’ glass” he laughed, which made me glad of my present career, where I’m more likely to get hit in the eye with buttercream than anything else. Bitter aperitivos from Italy also play an important role in cocktail-making, at least to me (I love a bit of bitter in a drink) and many of the aged cocktails in the shop have a dash of bitters, such as amaro or Nardini bitter, which is made with rhubarb, absinthe herbs, and sour orange, to give the cocktails a bit of an edge. We tasted some of the house inventions, such as a Mexican Negroni, made with Red Noilly Prat, Nardini bitter, tequila bianco, and a shot of mezcal. Sipping one that was freshly made versus one that had been barrel-aged for six months revealed how a leisurely wait in a barrel really mellows out a cocktail. And as we found out, it mellows out those who drink them, too! I have to say, patrolling the store, I usually leave there with an extra bottle or two of something interesting to mix up at home. (Even if I’m walking home and have to lug them over my shoulder!) And now, my cocktail barrels on my kitchen counter are back to being full. But I don’t dare leave mine outside – I think they’re be swiped in a New York, or Paris, minute. So I’m keeping mine safely inside. Where I can keep an eye on them. 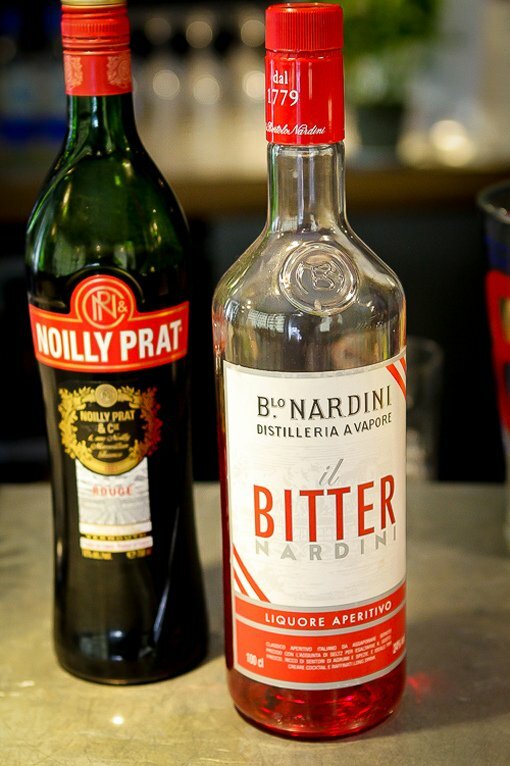 I see Noilly Prat rouge in your pictures – is that what you use? 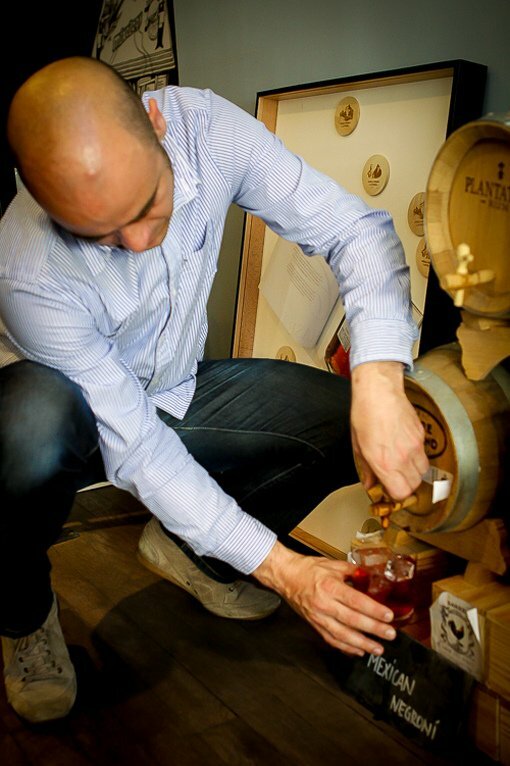 If you like bitter, you might want to try Cocci’s red vermouth di Torino, which has a brilliant balance of bitter and sweet. Since I tried it I’ve become a bit of a vermouth snob and don’t really like using anything else! 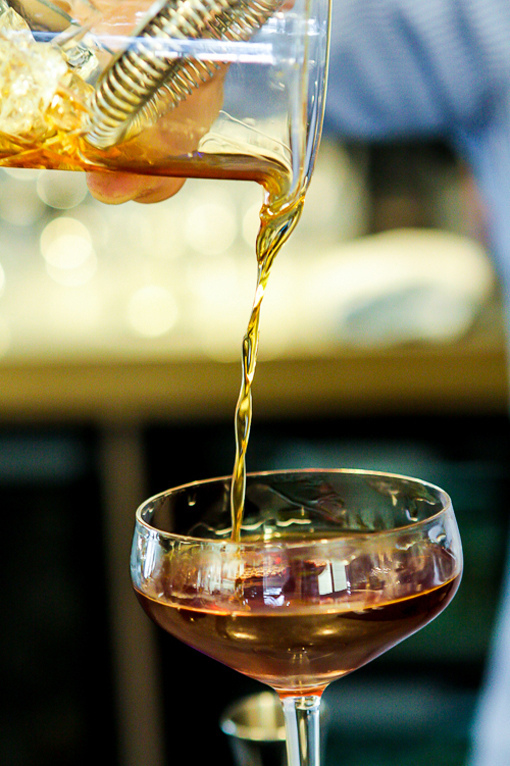 There is a bottle of Lillet rouge languishing unloved in the cocktail cabinet now – not because it bad, but it’s much more a sort of ‘on its own’ aperitif and doesn’t stand up so well in the kind of cocktails I like. I took a few bottles of red vermouth and bitters home to taste them, because I was interested in tasting them side-by-side. The Dolin, made in France, was pretty mild. And that Punt e Mes was a lot more complex. 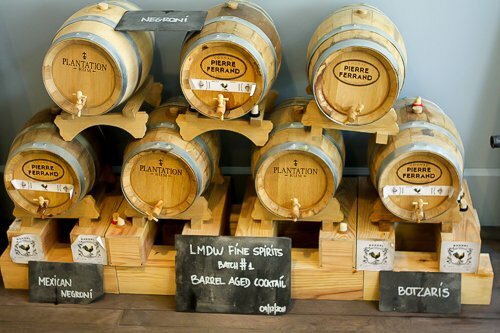 I did not see the Cocchi at La Maison du Whisky – although I looked and it’s on their website, but do love the Nardini bitters (which is more expensive, at €40/bottle, but quite tasty.) 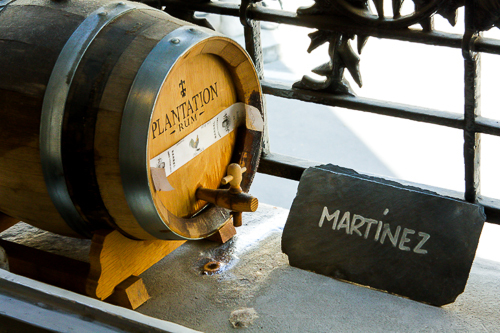 Since I’m barrel-aging, am not sure how much of those nuances stay or go during the process. Time will tell! Whisky always smells like Christmas to me. Not entirely sure why, but it does. This place looks amazing – and I don’t even drink. So many exciting bottles. Hope that you have a great Christmas, David! I love it when you bring us a little bit of Paris. Thanks from icy Toronto! So the barrel you have, it came from your friend who had used it to support a bookshelf, right? Did the MdW people have any ideas as to where you could procure barrels? I a barrel from a local bar, that had one they weren’t using and offered to let me borrow it. I haven’t used the other one yet, that a friend gave me, that she was using to hold up a bookshelf. 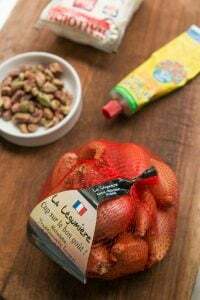 There are places that sell them online in France, but you do need to make sure that they’re not imported from China, since a distiller warned me that they may be coated with something that you might not want to consume. Sounds fascinating. I too need to find your Negroni post. 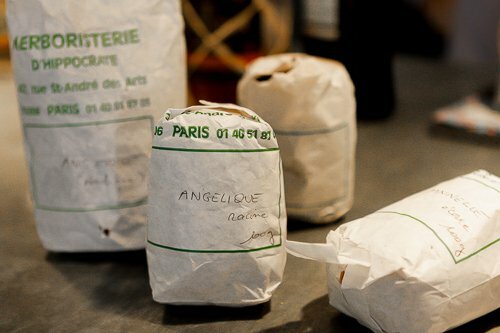 When I’m in Paris, I get Italian things at a shop on Rue des Abbesses. 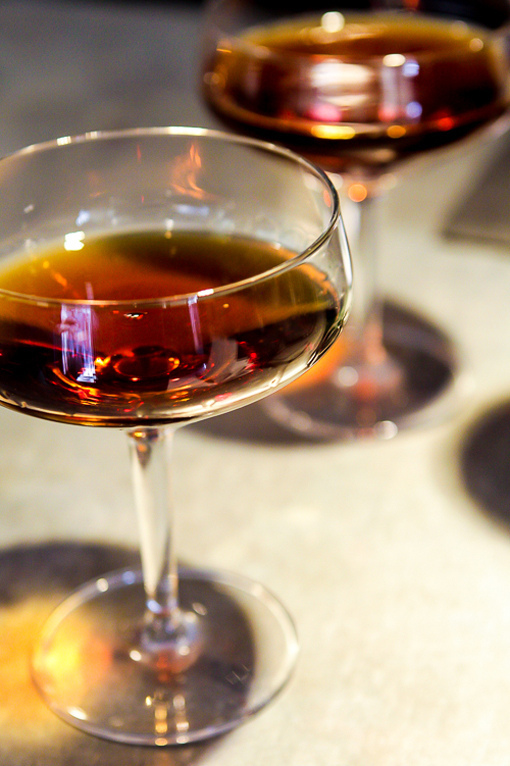 Look for sweet vermouth there. Now near Savannah, GA, I miss le quarter des Abbesses! What a delight! My mouth is watering away! I never heard of aged cocktails before. It sounds like a bad habit I really do not need, but am willing to dive into. Thanks so much for the enlightenment. Happy Holidays, David! love your site David . All the best to you in the new year . 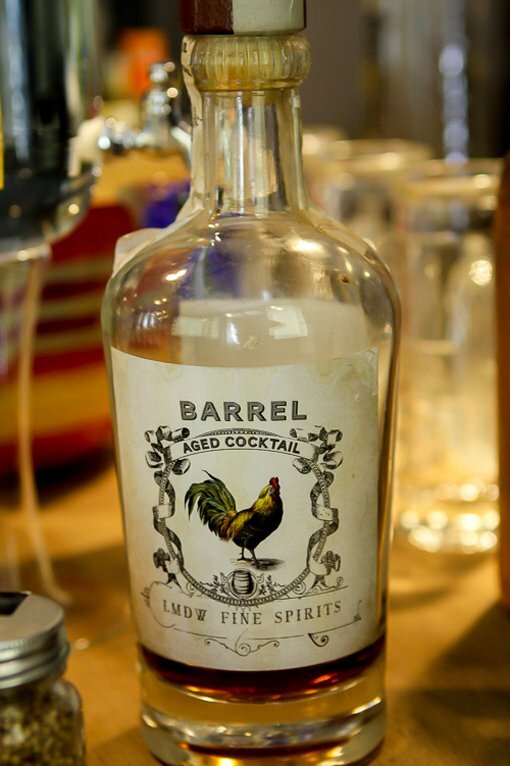 barrel aged cocktails? fabulous! 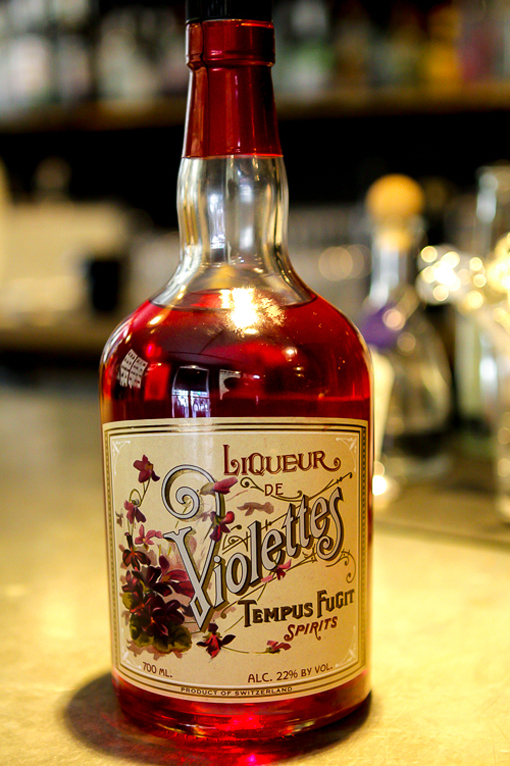 THank you for posting because i had forgotten that Maison du Whisky opened the liquour store at Odeon and only ever think of the rue d’anjou… and OMG Tempus Liqueur de violette? !! **starts running to Odeon, realizes the time and the date, grumbles, notes for the New Year if not before** Thank you for this post! Love that shop David! We stay at Camdebord’s Relais Saint-Germain across the street and I drive my husband crazy trying to “read” the windows whenever we head out for the day of shopping/touring. So glad you’ve filled us in on the complexity of their stock. Could a book about your home elixirs be brewing in the future? sounds weird to me! Nice post thank you. 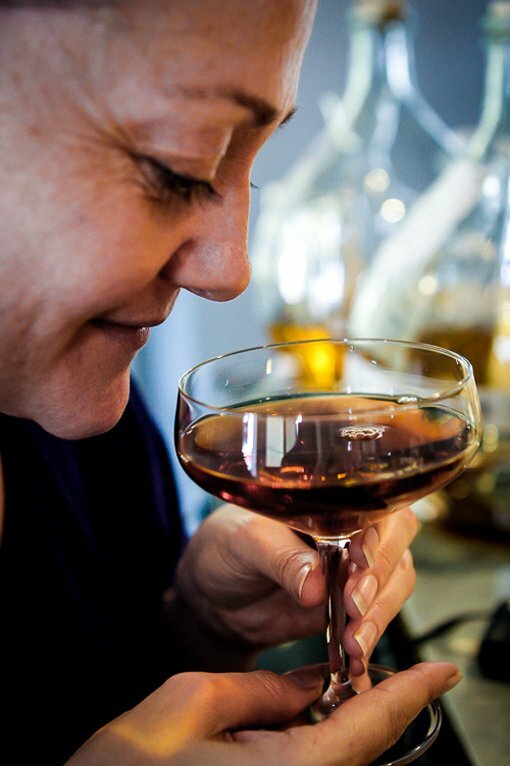 While our tour group was in Nice in March we were mistakenly given an aperativ of a violette liqueur with sparkling wine – to me it was the most memorable drink of the tour – little tiny sips – heaven. Margaret and Liz: Thanks! Happy holidays to you as well. Charles: I tried to find Peychaud’s in Paris but no one carries it. I had people from the US send me some bitters to use in its place. David. Available through Amazon, or the company will ship directly to you. I do like the vintage looking labels. Just for the look, I can buy. My husband developed a taste for whiskey, scotch and alike, however I just can not get over the woodsy smell. I am trying different mixes, thinking maybe one will be hit. We’ll see. Hiiicup! While I sip my boring cranberry juice and vodka, I’m feeling very left out of this interesting bit of cocktail drinking which is new to me! Interesting feature, but what also caught my eye was the glassware. The shape of the wide, low topped goblet is different than anything I’ve see before. Are these designed especially for certain liquors…and do they have a name/use descriptive? Or am I reading to much into the style. Perhaps it is ‘just’ a wine goblet???? I love those glasses as well and I’ve not seen them in any shops – but they must be available in professional bartending/restaurant supply shops. 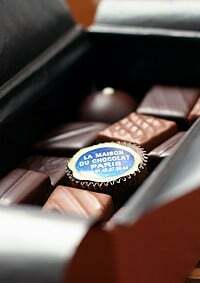 I think they may be made by a company called “Chef et Sommelier” and go by the name “coupe à Champagne” or “coupe à cocktail.” They’re for sale from companies like Delamaison in France and I’ve seen them on Amazon (USA) as well. I stumbled upon the beautifully aesthetic bottles of the Tempus Fugit line last year this time and was at first enchanted by the Kina label. After reading up a bit I was anxious to get them and ended up having to order them online. The Kina makes a very tasty aperitif all by itself, and one mean Vesper martini that will put you on the floor, but with a happy taste. 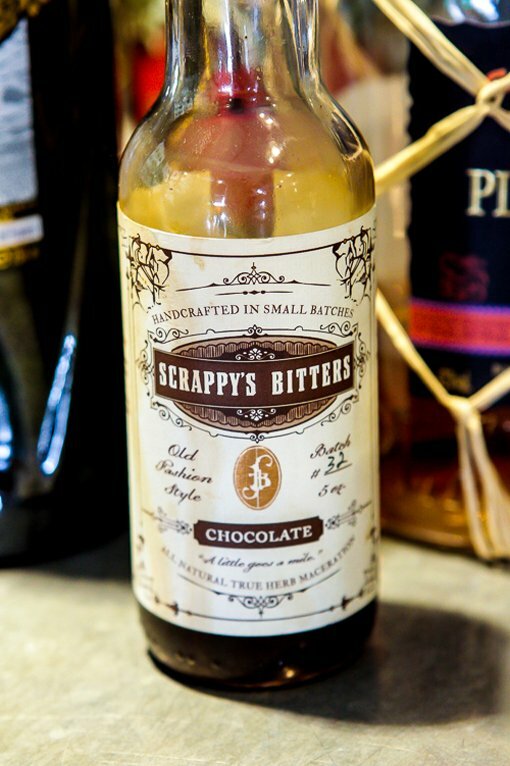 The creme de cacao and the creme de menthe make a fabulous grasshopper! They were sold out the the Violettes so I have yet to try that one. 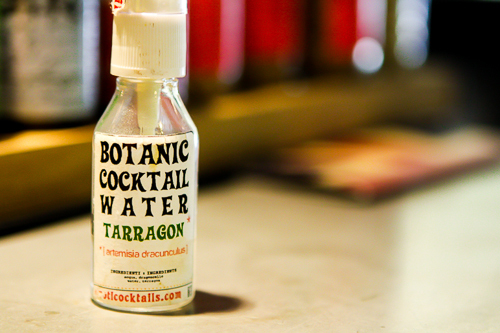 I have a friend that we call our “mixologist” as she loves trying out her new concoctions on us. I bet she would love a class in making bitters! Happy Christmas David, and thank you for all the entertainment and education over the past year. 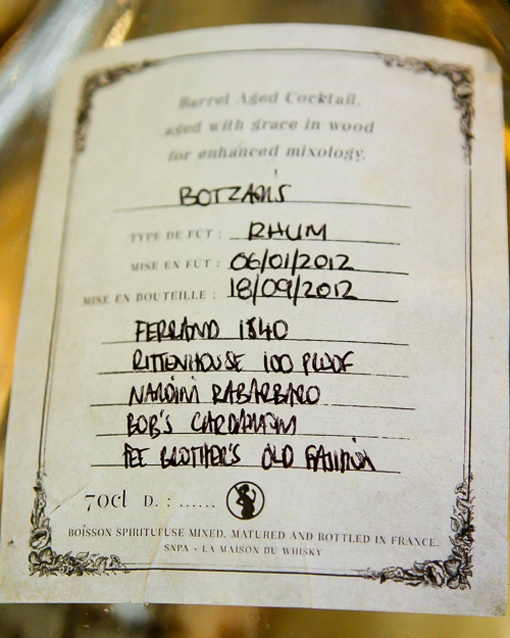 Peychaud’s Bitters are different and great, with an anise undertone. 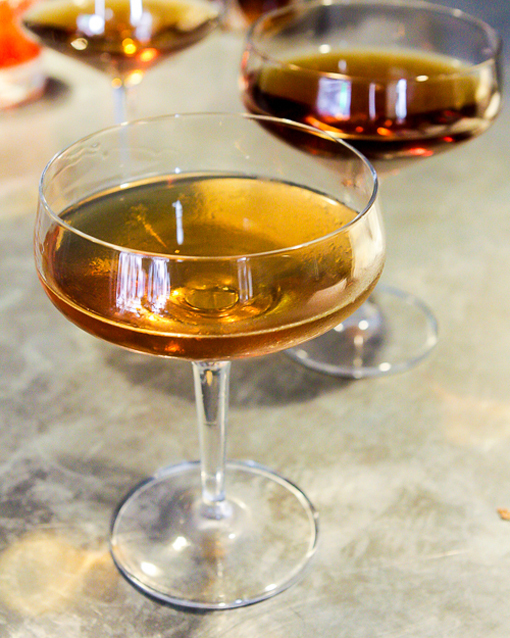 The classic use is in a Sazerac, but try a Honey Fitz – 1 1/2 oz. aged rum, 3/4 oz. grapefruit juice, 3/4 oz. honey syrup, and 2 dashes Peychaud’s. I make them every Christmas. 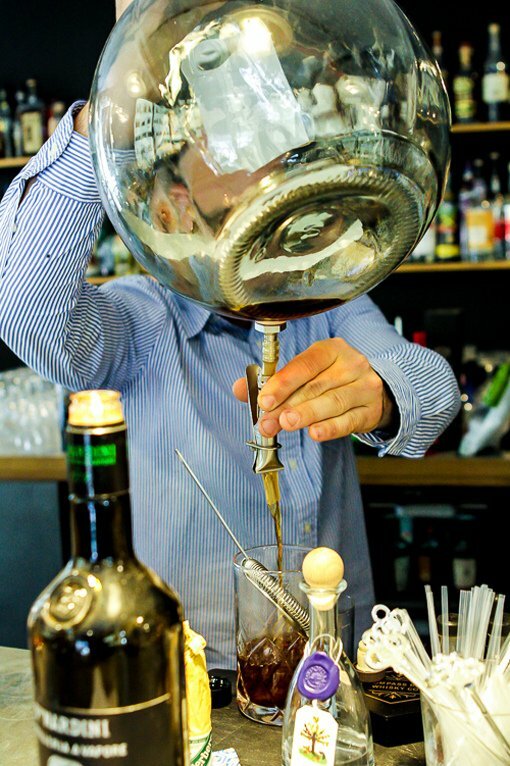 David & Sam: I have something called Creole Bitters, made by Berg & Hauck (The Bitter Truth) that I think is meant to be very similar to Peychauds, and I use that in its place. Sam. Also for a ‘Muddled Old Fashion. A little sugar, some Peychauds, a cherry and a slice of orange. Muddle all of this, and then add some club soda. End with your favorite Bourbon..Lots of Bourbon. Off topic, but am looking for that SF Christmas radio station online you mentioned a couple years ago – can anyone tell me which one it was? Thx! It’s called Xmas in Frisko and is on SomaFM, which you can find by using those search terms – enjoy! Thanks so much! also, the light, colors and composition in that 4th photo are gorgeous, well done! Just heard your interview on The Splendid Table! Your chocolate cherry fruitcake sounds amazing! Happy Holidays to you David. I loved this post, especially the photos. Your blog is the only one I read. Always interesting and humorous. Thank you so very much! Hope you have a happy birthday David — isn’t it the day after Christmas? Loved the photos in this post. They are just divine. When are you going to do food and photography tours? 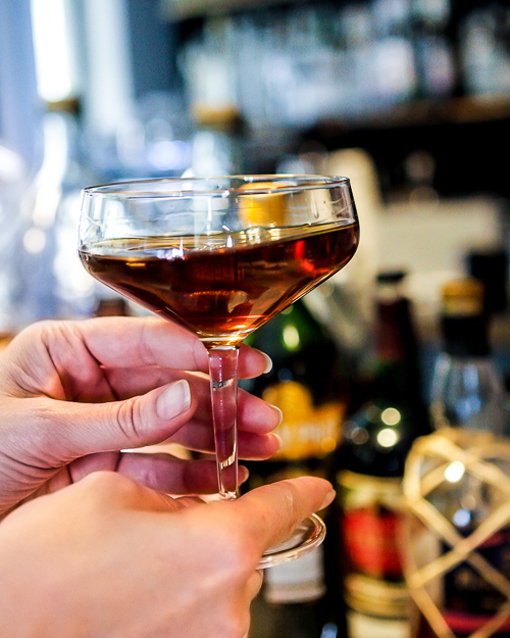 Next time you pop over to La Maison, and if you like Negronis, maybe ask for a taste of Antica Formula Vermouth if they carry it. 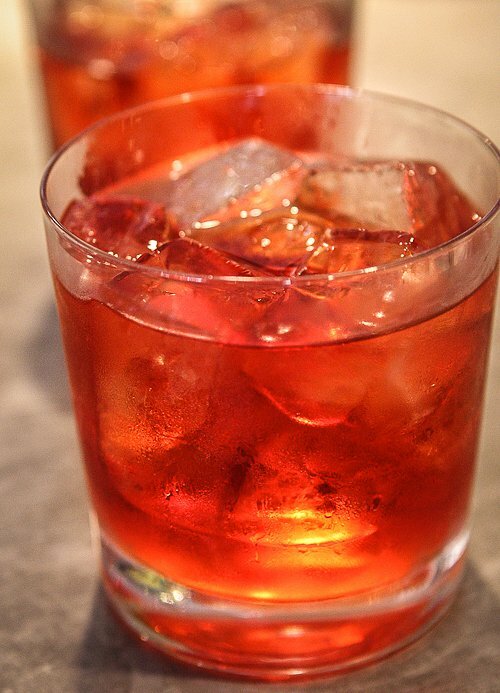 It is really a great vermouth to have on hand for Negronis. I heard those special “coupe à Champagne” glasses were modeled after David’s pectorals.